The Hamilton lab featured on Growing Children: Autism on BBC4 on Monday 13th August. The episode is available on BBC iplayer (link may not last long!). The Hamilton lab has received funding from the European Research Council (Starting Grant) for a project called INTERACT. 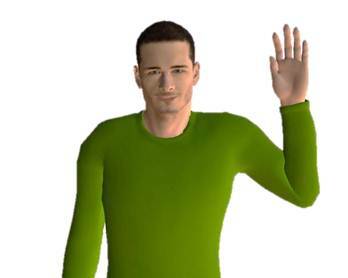 This project will use computer-generated avatars to examine the fundamental mechanisms of human social interaction. Antonia Hamilton is delighted to accept the EPS prize lectureship for 2013, and will be giving the prize lecture at Bangor University in the summer of that year. She has also been promoted to Associate Professor in the School of Psychology. The Hamilton lab has been awarded a small grant from the ESRC to study the control of mimicry by different social cues. The Hamilton lab has received funding from the Waterloo foundation for a project in collaboration with Dr Elisabeth Hill. This project will test the relationship between motor skills and social skills in primary school age children. The first Hamilton lab paper based on work performed only at the University of Nottingham is accepted - Ramsey & Hamilton (2010) NeuroImage. The Hamilton lab is established at the University of Nottingham. Funding from Autism Speaks and the ESRC allows us to begin work immediately. Rich on TV Rich demonstrates one of our new studies to the BBC. New dance study covered in a press release from Dartmouth. The research paper is on the Publications page.